When choosing car insurance options, you may not be aware that you have a choice to accept “verbal threshold” or “limitation on lawsuit” options. Sometimes referred to as “limitation on lawsuit,” the verbal threshold means that you voluntarily waive your right to sue for any damages with a few very specific exceptions. Some insurance carriers will offer this verbal threshold limitation in an effort to lower your monthly premiums. What you may not know are the restrictions this will place on your ability to sue after an accident if you accept the cost savings. In New Jersey, auto insurance companies adopted these threshold or limitation policies as a way to comply with new laws that would remove dollar amount caps from potential lawsuits. What was happening, prior to these changes, is that people would insist on unnecessary medical treatment after car accidents, just to push their dollar amount to the window where they could sue. However, even though the intent was to more clearly define what types of injuries can be litigated, there are still many hurdles. Even if you have experienced one of the above-mentioned six issues after a car accident, you may find it difficult to sue anyway because you need medical proof. Many doctors are reluctant to testify that any injury is permanent. They will hedge and discuss possibilities of improvement, which can drastically affect your likelihood of winning a claim. Therefore, it is important to fully understand your options before accepting the verbal threshold or limitation on lawsuit options from your insurance carrier. Even though it may save you a few dollars per month, it could end up hurting your chances at a fair settlement in the long run. 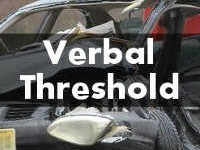 If you have any questions about verbal threshold or limitation on lawsuit, contact the JFM Personal Injury Law Firm. With nine New Jersey locations and a team of experienced New Jersey attorneys, they can answer your questions and help you to understand your options.